In a sport where teamwork is often a forgotten aspect, it was the sacrifice for the team that enabled Blue Ridge to prevail over Montrose Montrose in a battle for the Lackawanna League Division II Wrestling title on Monday, Jan. 28. Both squads entered the match with a 4-1 record – and also tied with Western Wayne who was hosting Lackawanna Trail that same day. Both Blue Ridge and Montrose juggled their lineups to get the most favorable matchups. One of those switches proved to be the pivotal point in leading Blue Ridge to capture the school’s first Lackawanna League Wrestling title. Alec Martin moved up two weight classes for Raider Coach Tim Esposito to fill a need at 152 pounds. When Martin pinned Montrose’s Jacob Craige in 1:43 it was more than what was expected. Blue Ridge also got pins from Nathaniel McArthur who pinned Dailynn Eisenbarth in 3:55 at 126 pounds; and Adam Roe who decked Roman Carrero in 1:41 at 160 pounds. Tom Gudykunst fell Cameron Harder in 2:25 at 170 pounds. Just as important was a bout that the Raiders actually lost. At 132 pounds, Blue Ridge’s Cole Soden kept off his back against Montrose’s highly regarded Andrew Rosevear. Despite Rosevear winning the match 5-1 those three points proved to be pivotal for the Raiders’ 42-39 win. A pin adds six points to a team score; and a decision earns three. 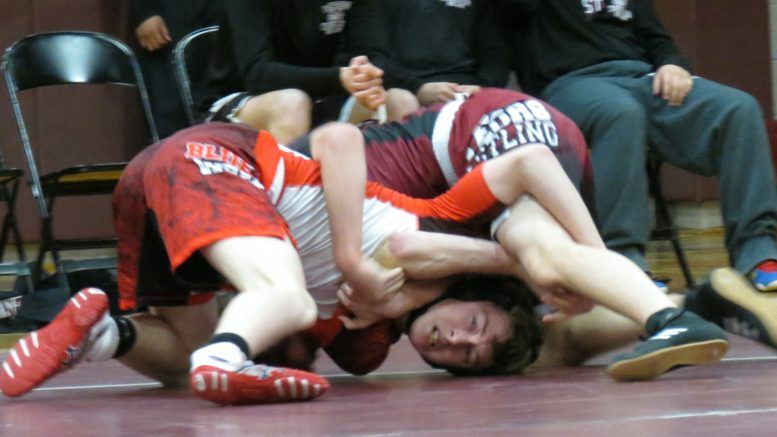 Had Soden been pinned, the final score would have ended in a tie. “All the matches were important, but they were our two heroes, tonight,” Esposito said, heaping praise on Soden and Martin. Blue Ridge picked up forfeit wins by Eli Aldrich (220), Gavin Crawford (113), and Isiah Valentine (120). Along with Rosevear’s decision win, Montrose got pins from Bryan Ryan at 195 pounds when he put Ben Gudykunst on his back at the 53-second mark. The Meteors’ Justin Kelly pinned Will Clauson in 23 seconds at 285 pounds. The Meteors picked up forfeit wins by Nick Harder (106), Brennan Kanna (138), Joe Hester (145), and Marc Avila at 182. With the Blue Ridge win – along with Lackawanna Trail’s 48-32 upset of Western Wayne – history was made. Not only did the win give the team the program’s first Lackawanna League Divisional Wrestling title, it also enabled Blue Ridge to host Friday’s Dual Meet with Scranton Prep, Tunkhannock and Wyoming Area. Be the first to comment on "BR wrestlers capture division title"